Please join BONO/U2 and friends in support of the ONE Campaign and Make Poverty History. Although the 2006 G8 meeting of world leaders has passed, poverty and unfair trade in the world have yet to be respolved. "Rock music is rebel music." What is Bono rebelling against now? "Rebelling against my own indifference - the idea that the world is the way it is and there's not a damn thing I can do about it; so I'm trying to do a damn thing. What's your problem? ...Why are you here listening to me? What have you given up to be here? You gotta ask yourself why you are doing this; keep checking your motives." Leveraged billions from other rich countries. 23 of the poorest countries in the world managed to meet conditions to get debt payments reduced and spend on the people who need it most. In Uganda twice as many kids are going to school. In Mozambique debt payments are down 42% allowing health spending to increase by 14 million (that goes a long way in Mozambique). "We must follow through with our ideals, or betray something at the heart of who we are." - Bono. 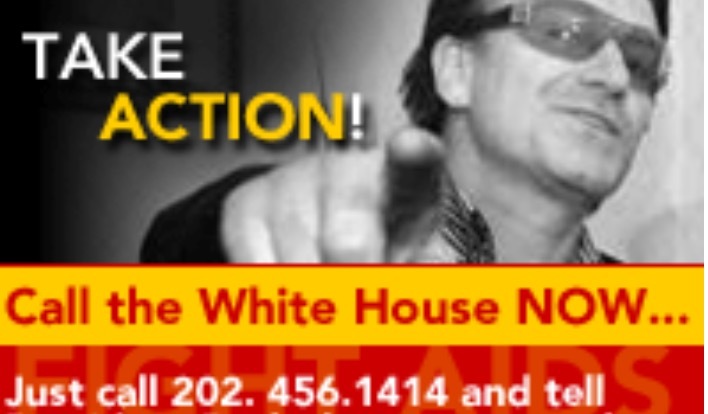 Visit www.ONE.org to help Bono follow through on his ideals to resolve the AIDS crisis in Africa. On April 29th 2003, U.S. President, George Bush, announced a new emergency plan for Global Aids Relief (specifically including African Aids relief) to appropriate funding to expand what works to save lives. The Global Aids Relief Initiative includes establishment of Global Aids Coordinators to organize clinical networks for HIV testing and administration of effective medications for treatment of AIDS. The President has requested we move forward with speed and seriousness to urge Congress, the Senate, and all nations to join in on this effort. [Source: CSPAN-2]. Photo by permission of datadata.org. 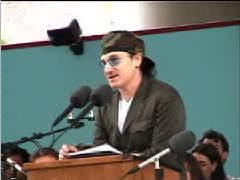 Click into U2.com News May 24, 2004 (24-05-04) for a video clip of Bono's speech at the University of Pennsylvania entitled "You are the Generation...". Visit the official U2 website at www.U2.com for U2 news, music, tour updates, and more! "There's never a deadline or time limit on doing something that's right." Melanie Silos - Rock for Learning! Copyright 2001-2012 New Moon Publishing & Consulting All rights reserved.